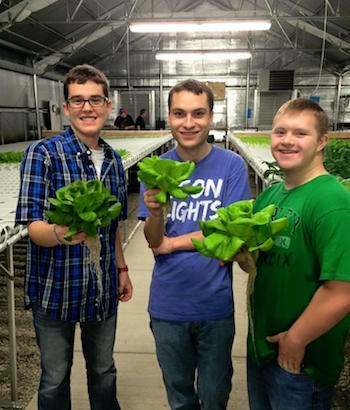 (from left to right) Colby Myers, Andrès Guillen and Luke Gerhardt operate CALCan Enterprises LLC, a hydroponic greenhouse outside of Topeka, Kansas, that grows lettuce and arugula. Photo courtesy of CALCan Enterprises LLC. On the outskirts of Topeka, Kansas in a greenhouse equipped with a hydroponic system, three families have come together to provide meaningful work for their children who have special needs. The business name is derived from the first letters in each of their adult children’s names — Colby Myers, Andrès Guillen and Luke Gerhardt, who put in 10 to 15 hours a week at the greenhouse and receive payment for their labor. “The idea of starting the greenhouse came from the fact that all three of our families have kind of a connection because all three of us have boys with special needs — two with autism, one with down syndrome, and they were nearing the time of high school graduation, and it was like, what do we do next?” Kris Myers says. The Gerhardt family originally came up with the idea for a greenhouse before bringing the concept to the two other families whom they knew through their children’s school district, Myers says. The Gerhardts already had 8.5 acres of land, so Myers says that was the natural location for the greenhouse. Gerhardt says that when brainstorming for ideas for employment for his son, he got the idea for a greenhouse after Luke had interned with MGHonor Farms in Cheney, Kansas, a farm growing chemically herbicide and pesticide-free food. The experience sparked Luke’s interest in becoming independent and productive, Gerhardt says. Myers says the repetitive nature of the tasks required in the greenhouse has allowed the boys to become more independent. “This is very systematic, so it definitely has been a great opportunity for the boys to get comfortable doing something and get proficient at it, and so they don’t constantly have to have somebody hovering over,” she says. Colby, Andrès and Luke currently work Tuesdays and Wednesdays after school and on Saturdays, Myers says. She says harvesting is done on Wednesdays and then Gerhardt delivers the produce. With the boys help, the 6,000-square-foot hydroponic greenhouse operation yields 80 to 85 cases of leafy greens. Gerhardt says the goal is to produce between 100 and 120 cases. Myers says seeing the boys work as CALCan employees is very rewarding for her as a parent, especially as the men’s peers watch them at work. “For those people that come in and see them working and getting to be independent and not having someone right there by their side directing them, having a sense of ownership, I think that’s probably been the most rewarding for me as a parent,” Myers says. Myers and Gerhardt refer to CALCan in terms of the operation being in its pilot stage of development. Once CALCan reaches its goals, Myers says, the business would like to provide internships and other opportunities to those in the community. Gerhardt says CALCan is currently working with the local school district’s special education department to start a program that could allow students to work in the greenhouse for an hour once or twice a week. Students would learn skills such as how to apply for a job as well as greenhouse operations, he says.